Bodegas Roda, Rioja Reserva red wine 2006 is a blend of 97% Tempranillo and 3% Graciano and Rioja reserve shows aromas of crushed red fruit, as well as ripe elegant and structured fruit on the palate, with round tannins and a very long finish. 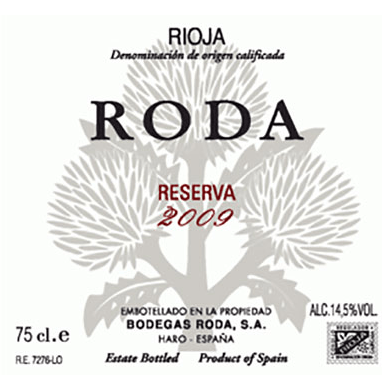 The 2006 Roda Reserva is a pure Tempranillo aged in French oak of which half is new. It has a clean and fresh, almost clinical bouquet with fresh red berry fruit, wild strawberry and raspberry mixed with leather and bay leaf. The palate is very well-balanced with supple tannins on the entry. It builds nicely in the mouth, leading to a very elegant, supple finish of wild strawberry, raspberry and cocoa, kept in focus by a well-judged citric thread that runs through from start to finish. This is one of Roda’s finest wines. Drink 2013-2022.
he wines from Bodegas Roda should need no introduction. “We want to offer consistency,” winemaker Gonzalo Lainez told me. “We own and control 28 different vineyards and we choose the best seventeen every year. The Reserva is more red fruit character, more gastronomic. Other single vineyards that have a black fruit character are not so easy to find at an early stage and are blended into Roda I. So vineyards can end up in either, or be sold off. We work under three tenets. We like acidity in our wines, the oak must play a secondary role and the most important, supple tannins.” I enjoyed the wines of Roda, but to be frank, I often found myself searching for a sense of personality, as if the wines were somehow pre-designed instead of working with what Mother Nature gifts. They are highly pleasurable, but in an age where high-end consumers are looking for wines that say something, I would like to see the wines from Roda opening their mouths. Moreover, I do detect the oak too often, analogous to a supporting actor reading the leading actor’s lines. These tasting notes derive from samples that were mostly tasted twice in the UK. Vineyards: Bush vines over 30 years old, yields limited to 1,5 kgs. per vine. Grape harvest: From the 12th of September to the 9th of October. Ageing: In 50% brand new and 50% second use French oak barrels. 16 months in barrels and 20 months in bottles.